On August 11th I wrote in my journal: “I think I should start a blog”. 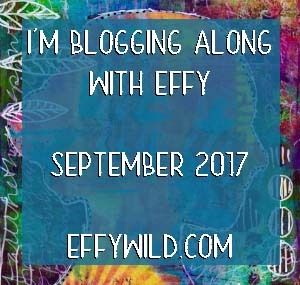 Then a few days ago Effy Wild ( effywild.com ) put out a blogging challenge – to blog something every day in September. So here I am, setting up this blog. It will be about my art projects, things I’m interested in, and anything that comes to mind. I am still setting up the site, and that means things like the site layout and “theme” may change as I go along. Yay! Blogging newbie here followed the link from Effy’s. I’m CazzylineOnline dot blogspot dot com. I may be copying a few of your ideas, once I figure out how! Blessings as your blogging journey unfolds! I’m just starting on the block too. And yes, *themes* are difficult. I like how your blog is set up – it looks really good!